Like the rest of the state, Southern Virginia has a long and rich history. 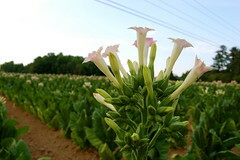 Tobacco was the mainstay of the economy here for generations, and the area remains primarily agricultural. If you are looking to stay in a VA Country Inn, you are sure to find one in Southern Virginia. Fall is harvest time, and numerous festivals throughout Southern Virginia celebrate it. Visiting harvest festivals is a wonderful way to experience new communities. Listen to the music of local bands, see arts by local artisans and craftspeople, and discover regional food specialties. [caption id="" align="alignright" width="240" caption="Learn about tobacco while meandering through Southern VA."] [/caption] Kings Grant Fall Festival takes place in Martinsville on Saturday, September 18, 2010. That evening, relax to live bluegrass music by Mark Templeton & Pocket Change at the Martinsville Historic Rives Theatre. The charming, historic town of South Boston has its Harvest Festival on September 25 - the same day Martinsville hosts its annual Oktoberfest. The Danville-Pittsylvania County Fair takes place at the fairgrounds from September 17 - 25, 2010. If you have never been to a county fair, you'll find it a fascinating and fun experience. Check out unusual poultry and Rosaire’s Bears – The Big Bear Show. Also in Danville, the Affair on the Square Concert Series will feature several bluegrass bands from 6 to 10 pm on September 23. Exploring small towns is just part of a holiday in Southern VA Country Inns. Equally important is experiencing peaceful evenings on wide porches, awakening to the sounds of songbirds, and indulging in a breakfast fit for a hardworking farmer.